The first time I heard "Ya' know, back in the good old days, if you didn't serve Hedrick at your bar, then you didn't have a bar." was in the late 1990s while I was doing the advertising and design for the Big House Brewing Company—a now defunct brewpub, here in Albany. At that point, I knew enough about the city's history to know that it had, in the recent past, been run by the political boss and Albany Democratic Party head Dan O'Connell. O'Connell came to power in the early 1920s, and he and his brother Ed ran the city with impunity for the net 50 years. Aside from their political manipulation, the O'Connell's Democratic Machine also oversaw the cities darker side—and sometimes beer fells into that "darker" category. The brothers legally purchased Hedrick Brewery almost immediately after the repeal of prohibition, (Although they most likely were the beneficiaries of the brewery's nefarious operations between 1920 and 1933, as well) and for all intent and purpose, saved the brewed from obscurity. They continued to run the brewery until 1965. I understood that the O'Connells were two, pretty powerful figures; and that they owned a brewery, and with that they received a little extra, shall I say "endorsement" from the local watering holes. But, I figured the O'Connells and Albany for that matter were, quite honestly,a pretty small fish in a pretty big pond. I always thought the "didn't have a bar" rhetoric, was just that, rhetoric. A little Albany hyperbole to make for a good story. A mythologizing of a local character. That was until I came across an article in the Thursday, October 27, 1938 edition of the Sliver Creek News and Times of Chautaqua County, New York, about—among other things—the O'Connells. For those who don't know, Chautaqua County is on the opposite end of the state, south of Buffalo—some 350-odd miles from Albany. So, why would a newspaper in western New York be writing about the local political bosses of Albany? Because a gubernatorial candidate was talking about them. By the mid-1930s, Thomas E. Dewey was the golden-boy off the New York Republican party. Dewey had mounted a one main campaign against in the mob and corruption in Manhattan—first as a federal prosecutor, than as a special prosecutor appointed by Governor Herbert H. Lehman, and finally as District Attorney of New York County. Dewey prosecuted mobsters like Waxy Gordon and Dutch Schultz; he targeted Tammany Hall officials with ties to organized crime; he convicted former hard of the New York Stock Exchange, Richard Whitney, of embezzlement; and clipped the wings of American Nazi leader F.J. Kuhn. "When a tavern keeper puts in Hedrick's 100 per cent. The sky is the limit. He gets his license renewed without a hitch. He can have slot machines, hostesses, music and dancing. He can forget every technical regulation. He can stay open all night and throw away the key." But it's a line, from near the very top of the article, that really caught my eye. "In Albany the barrooms sell Hedrick's beer—or else." There it was. The hearsay, was no longer hearsay. Thomas E. Dewey, had called out O'Connell's beery strong-arming in a public and recorded forum. In mind mind that's proof that the "didn't have a bar" comment isn't as hyperbolic as it seems. So what happened? Not much, actually. Dewey lost the 1938 election—albeit by a narrow margin. He did win however in 1943. He became one of the most successful New York State Governors, serving until 1954. He ran, unsuccessfully, as the Republican candidate for President in 1944 and 1948. Throughout his governorship, he continued to pester the O'Connells. Although, annoyed they were essentially un-phased. Hedrick continued to be seen in every barroom and tavern in Albany, well into the 1960s, and the Democratic Machine continued its control of the city. sSome of its effects can still be felt today. A classic story is told of the 1942 race for governor. The Democratic nominee was John J. Bennett, way as attorney general had conducted an investigation of Albany, which made him distinctly unpopular there. A group of big gamblers from New York figured to make a killing, and offered to wager that Bennett would not carry Albany by 20,000. Dan turned them away, saying, "those guys are anxious and will be back." A few days later they did return, this time offering to bet on a margin less than 15,00. Dan took all the bets he could on that figure, and the amount involved may have approached $100,000. 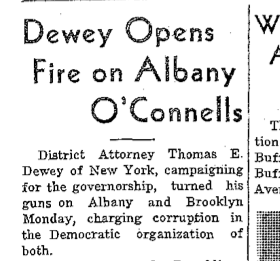 Bennett lost the election to Thomas Dewey, but carried Albany. By 19,000 votes.